What gave rise to our modern conceptions of professional status, and how did particular professions gain their privileged status? 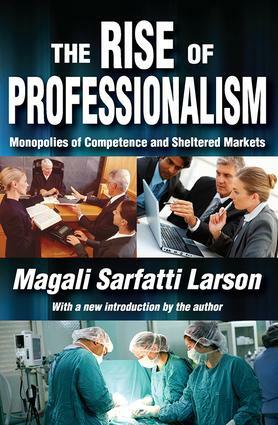 Magali Sarfatti Larson shows how our present conception and acceptance of profession was shaped in the liberal phase of capitalism. Larson argues that professionalization was both a response to the extension of market relations and a movement for the conquest of collective social status by sectors of the bourgeoisie. By comparing the development of various professions in England and the United States during the first part of the nineteenth century, the author gives concrete historical illustration to the multiple relations professions form within their society. Larson examines the new conditions of professionalization in the phase of corporate capitalism, drawing on a number of historical and sociological sources. While professions began as a mode of autonomous work organization, many credentialed occupations aspire to professionalize in order to shelter the labor markets in which they work. Larson argues that the idea of profession can function as a form of ideological control and concludes that today professionalism works against many of the values that had been historically vested in it. This classic book, complete with a new introduction that brings the work into the twenty-first century, is timely and should be read by all interested in the history and development of organizational life.